In the report “Work Faster or Get Out” (March 2015), Human Rights Watch criticises the Cambodian government for failing to protect garment workers who are producing for international apparel brands from serious labor rights abuses. Human Rights Watch was in contact with Adidas, Armani, Gap, H&M, Joe Fresh, and Marks and Spencer. Statements from those companies are included in the report. Several High Street and high-end fashion brands have been implicated in a report on labour abuses in Cambodia. Human Rights Watch says it has uncovered alleged abuses at Cambodian garment factories that supply Marks & Spencer, Gap, H&M, Adidas and Armani. The pressure group found evidence of discrimination and anti-union practices, it says. It believes that short-term contracts can prevent workers from asserting their rights. HRW says it also found evidence of people being forced to work overtime and discrimination against pregnant women. 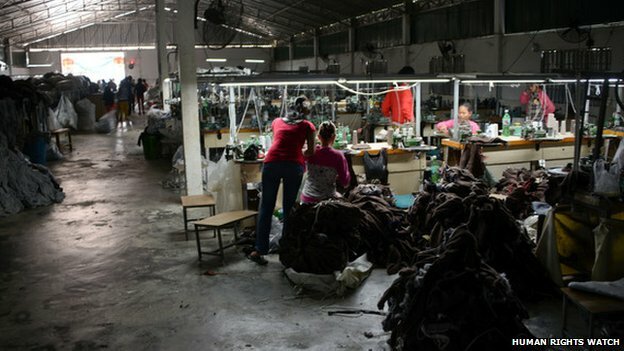 The study found that factories supplying major retailers often sub-contract work to smaller factories, which are more likely to hire staff on a casual basis..."These international apparel brands need to help labour law compliance by publicly disclosing and regularly updating the names and addresses of their factories," says HRW...Marks & Spencer does not publicly disclose the names of its suppliers but HRW believes that 13 of the 73 factories supplied goods to the British retail giant. "We have not been presented with any evidence to support these claims," a Marks & Spencer...said. "If HRW comes to us with any evidence we will, of course, investigate." The retailer insists that its suppliers adhere to strict ethical standards, including "providing good working conditions, freedom of association, treating workers with respect, limits on overtime and paying fair rates of pay. "All our supplier factories are audited regularly by third party, independent auditors and are visited by M&S compliance managers," the company said. M&S has committed to publishing a list of its suppliers in 2016. Adidas and H&M already publicly disclose their suppliers and HRW said that Adidas, Gap, and H&M have seriously discussed efforts to address the problems identified in the study. H&M told the BBC that supplier companies subcontracting work to smaller factories would lose their contracts with the retailer. "H&M has distributed a translated copy of its suppliers' list to local unions and labour rights groups to encourage whistle-blowing on undeclared units," the company said. Gap said: "We are investigating the alleged labour practices highlighted in this report. If true, they are unacceptable and violate our code of vendor conduct." Adidas said it has created a process for workers to seek whistleblower protection. "The vast majority of our supply chain in Cambodia is unionised,"...said. "Workers have the right to join unions of their own choosing."